Over the course of a long and chequered horsy career, I’ve been lucky enough to have a go at most equine activities, from eventing to dressage. However, despite living in Cheshire, a county awash with polo clubs and shiny four wheel drives, I’ve never had the opportunity to try polo. This hasn’t caused any sleepless nights, as I’d always considered the sport of kings required a suitably royal bank balance, but it’s always proved a slightly irritating gap in my horsy CV. Just try and stop me. And so, a few weeks later, I’m standing in a muddy field on top of a mountain ridge in the French Pyrenees with my mentor Jean-Rene. Jean-Rene, a retired maxillofacial surgeon, loves polo so much that he runs his own string of ponies, including a mare he trained himself. He discovered the game later in life, but has made up for it since. 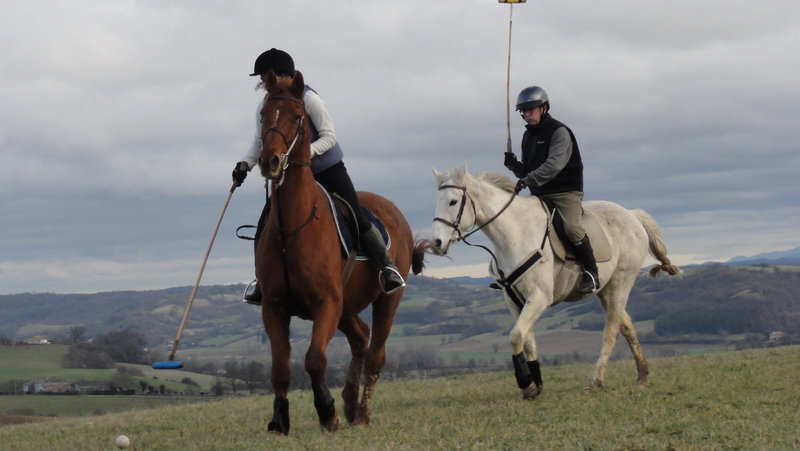 Every weekend, he can be found stick-and-balling along the ridge of the top field (the only place flat enough for miles around), and he’s just keen to teach me as I am to learn. “I need someone to play against!” he explains. 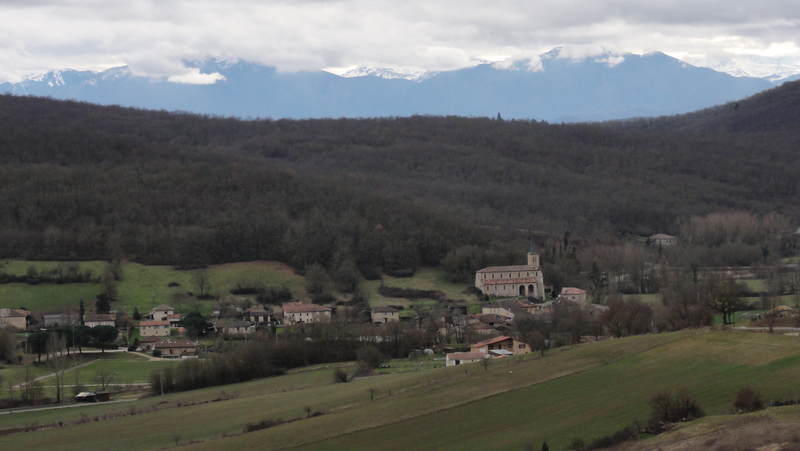 Polo is far less popular in France than it is in the UK, and the nearest club is over an hour away in Toulouse. 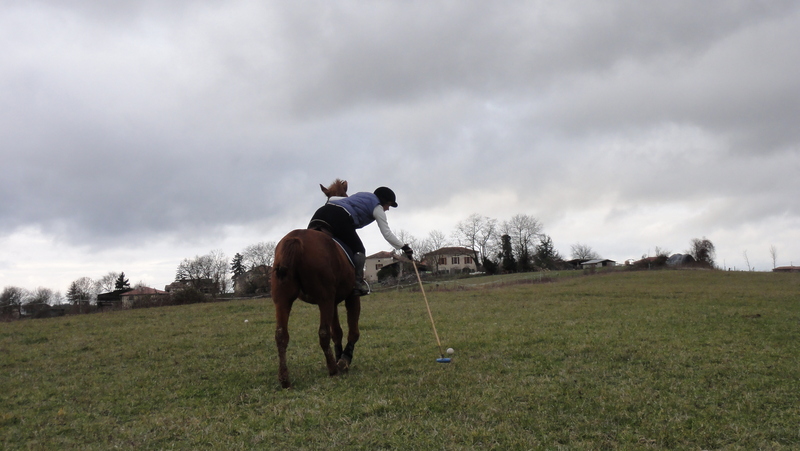 My mount is Gringo, a trained polo pony brought all the way from Chantilly, the hub of French polo. Jean-Rene mounts Pacifique, a smaller fleabitten grey mare he trained himself. I’m shown how to hold the mallet (thumb through the wrist strap, let the strap trail over the back of the hand. Turn the hand over and hold the grip like a tennis racket), then how to make the swings without hitting myself or Gringo. After a little while, I’m ready to try it on the move. Jean-Rene positions three balls in a line, and asks me to ride up the line at a walk, trying to hit each ball in turn. I’m not much good at controlling Gringo with both reins in my left hand, but fortunately he knows the game, and walks over to the first ball with little input from me. To start with, I’m fearful of hitting Gringo’s legs and don’t ride close enough to the ball, forcing me to lean uncomfortably out of the saddle. “Hit the ball along the line of the horse,” explains Jean-Rene. “You won’t hit him, particularly not at a walk.” On my next approach I’m bolder and manage a respectable ‘twock!’ as mallet hits willow. The ball only trickles a few inches before sticking in a tuft of grass, but that’s what happens when you don’t have a full-time groundkeeper. After a few more practice runs, Jean-Rene decides I’m ready to move up a level and trots along side, ready to block me every time I swing. I immediately go to pieces, so we repeat the exercise in walk until I can hit the ball most times, even with Jean-Rene defending. Getting better - and look at that view! The final verdict? Fantastic! Even playing with two people in a windswept field is a big adrenalin kick, and I’ll be coming back for more. To try polo for yourself, sign up for a trial lesson in the UK at a club near you – some clubs offer group starter lessons from only £40. ← Spring has sprung – well, nearly.